This popular tropical plant, Ficus elastica, is a member of the Fig family. it is native to India, Nepal, Burma, China, Malaysia and Indonesia and in its natural habitat can grow to 100-130 ft in height, and occasionally as large as 200 ft, with a trunk nearly 7 ft in diameter. The broad oval leaves can reach 18 inches in length. Many varieties have been cultivated for use as an ornamental indoor plant, including ‘Decora Burgundy’ which has leaves with a dark greenish burgundy colour, ‘Ruby Red’, with a variegated red marbled leaf, and ‘Sylvie’ that has highly patterned leaves with pinks, white, cream and green. Specialized cells within the plant produce a white liquid which can be seen when the plant is pruned or a leaf is cut. This latex was at one point used in the production of rubber but now latex for commercial production of rubber comes from an unrelated plant, Hevea brasiliensis. The Rubber plant is relatively east to care for. It prefers bright indirect light, and well-drained soil. Water thoroughly but allow to dry out between waterings. Overwatering will result in small weak leaves and stems. 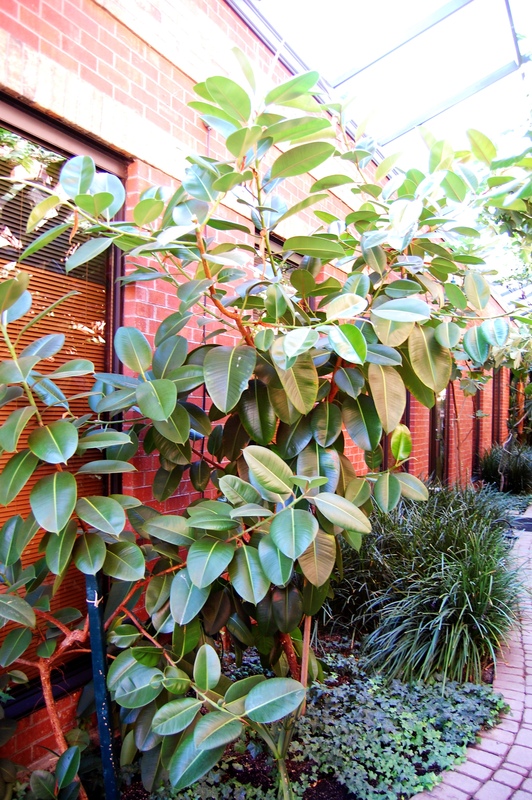 Although not as fussy as other members of the Ficus family, the elastica does not like to be moved and will often drop its leaves when relocated. Regular pruning will keep the plant full, as the cut stems will quickly produce two new shoots. 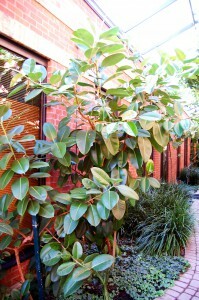 Ficus elastica is resistant to infestation with insects, although it will occasionally develop scale insect. This is a great tropical plant for office interiors; it is available in many sizes so works well as a floor plant or as a table-top specimen and the many unique varieties available are a nice complement to standard green foliage plants.